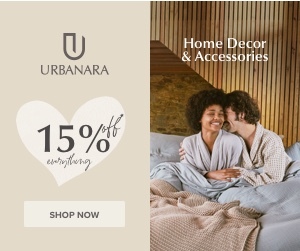 Founded in 2010, URBANARA is an online brand offering high-quality homewares at affordable prices. Quality, natural materials, craftsmanship and transparency about a product's origin are all part of the company's philosophy. The business model is straightforward: working directly with the suppliers, no middlemen, available only online and no excessive marketing budgets. That's how quality without the sky-high price tag is possible. UK Delivery Details: Delivery is free for orders over £50 within mainland UK and Germany. All other orders to mainland UK and Germany incur a £4.95 delivery fee. Urbanara is currently ranked 580 in the directory. Last month its rank was 987. 3231 products added to Urbanara 37 days ago. A Special Offer was added for Urbanara: £10 Off and Access to Exclusive Offers, Trends and Inspiration ... 39 days ago. A Special Offer was added for Urbanara: £10 Off and Access to Exclusive Offers 55 days ago. A Special Offer was added for Urbanara: Download Our Ultimate Bedroom Refresh ebook 55 days ago. Updated The link Urbanara was updated 59 days ago. 3231 products added to Urbanara 69 days ago. A Special Offer was added for Urbanara: £10 Off and Access to Exclusive Offers 72 days ago. A Special Offer was added for Urbanara: Download Our Ultimate Bedroom Refresh ebook 72 days ago. A Special Offer was added for Urbanara: £10 Off and Access to Exclusive Offers 75 days ago. A Special Offer was added for Urbanara: Download Our Ultimate Bedroom Refresh ebook 75 days ago.